During the early development of telephone technology, a unit was invented for representing power gain (or loss) in an electrical system. It was called the Bel, in honor of Alexander Graham Bell, the telecommunications pioneer. Follow-up question: a geologist, taking a class on electronics, sees this mathematical pattern and remarks, "This is just like the Richter scale!" Explain what the geologist means. Ask your students how these two systems of power gain expression (Bels versus ratios) compare in terms of range. Which system of expression encompasses the greatest range of power gains or losses, with the smallest changes in numerical value? Manipulate this equation algebraically, so that we can convert power gains expressed in units of Bels, into ratios. Challenge your students to estimate the log values without using their calculators. For example, they should be able to estimate the log of 1275 as being between 3 and 4; the log of 0.025 as being between -1 and -2. Work together to devise a technique for doing this, where there will be no guessing. Mathematical estimation is an important skill for technical people to possess. Not only is it useful in the event no calculator is readily available, but it also helps greatly in students being able check their (electronically) calculated work. I can't tell you how many times I've seen students blindly enter numbers into a calculator, only to arrive at an answer that is grossly in error, and not realize it at all because they cannot do the estimation mentally. Then, calculate the decibel figures that correspond to a power gain of 2 (ratio), and a power loss of 50%, respectively. It is important that students work through the original equations algebraically to obtain the answers rather than just look up these formulae in a book. Have your students write their work on the whiteboard in front of the other students, so that everyone has the opportunity to examine the technique(s) and ask pertinent questions. Be sure to let your students know that the figure of "3 dB", either positive or negative, is very common in electronics calculations. Your students might remember this expression used to describe the cutoff frequency of a filter circuit (f-3 dB). If we were to try to rate this amplifier's gain in terms of the relative power dissipated by a given load resistance (Pload when powered by Vout, versus Pload when powered by Vin), what ratio would we calculate? In other words, what is the ratio of power for a given load resistance, when powered by a given voltage, versus when powered by a voltage that is twice as much? An easy way to illustrate this principle is to ask your students to calculate the power dissipation of a 1200 watt heating element rated for 120 volts, if connected to a 240 volt source. The answer is not 2400 watts! 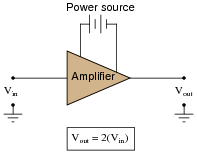 If we were to try to rate this amplifier's gain in terms of the relative power dissipated by a given load resistance (Pload when powered by Vout, versus Pload when powered by Vin), what decibel figure would we calculate? What law of algebra allows us to simplify a logarithmic equation in this manner? Logarithms are a confusing, but powerful, algebraic tool. In this example, we see how the logarithm of a power function is converted into a simple multiplication function. The challenge question asks students to apply this relationship to an equation not containing logarithms at all. However, the fundamental rule of algebra is that you may perform any operation (including logarithms) to any equation so long as you apply it equally to both sides of the equation. Logarithms allow us to take an algebra problem such as this and simplify it significantly. Nothing special here, just straightforward ratio-to-decibel calculations. Have your students share and discuss the steps necessary to do all these conversions. Nothing special here, just straightforward decibel-to-ratio calculations. Have your students share and discuss the steps necessary to do all these conversions. Nothing special here, just straightforward decibel-ratio calculations. Have your students share and discuss the steps necessary to do all these conversions. What does it mean to speak of the gain of a circuit? This term is very commonly used when describing amplifier circuits, but it may also be used to describe circuits containing nothing but passive components, and are thus incapable of amplifying. What letter is used to symbolize gain in mathematical equations? 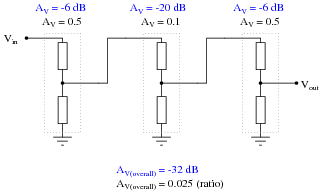 "Gain" (A) refers to the ratio of output signal compared to input signal. Discuss what it means for a circuit to have a designated öutput" and ïnput". Can they think of any circuits studied thus far that have places to input and output signals? Follow-up question: how does this gain figure (AV) relate to the "voltage divider formula"? Students should readily recognize this circuit as a voltage divider, from their education in basic DC circuits. Though it may seem strange to calculate the "gain" of a completely passive and indeed dissipative circuit, it is entirely valid. Discuss with your students the maximum and minimum possible power gain values for a circuit of this type. Follow-up question: what unit does this figure have, if any? Students should readily recognize this circuit from their education in basic DC circuits. Though it may seem strange to calculate the "gain" of a completely passive and indeed dissipative circuit, it is entirely valid. Discuss with your students the maximum and minimum possible power gain values for a circuit of this type. Also discuss with them the nature of ratios with regard to units. Translate this voltage gain ratio into a decibel figure. Explain why the conversion from voltage gain ratio to decibels is not the same as conversion of a power gain ratio to decibels. Discuss with your students the nature of the "Bel" unit: it is fundamentally a unit of power gain, not voltage or current gain. So, representing voltage or current gains in units of either Bels or decibels means representing those voltage or current gains in terms of how much power gain they equate to. Define what each of these units represents. "dBm" represents the magnitude of a voltage in relation to 1 mW of power dissipated by a 600 W load. "dBW" and "dBk" units represent the magnitude of a voltage in relation to 1 W and 1 kW of power dissipated by the same load, respectively. Follow-up question: how many volts is 2 dBm equivalent to? Here we see the decibel unit being used to represent absolute quantities rather than relative ratios. Ask your students what benefit would there be in doing this. Why not just represent signal magnitudes in units of "volts" instead? Why would we want to use an obscure unit such as the decibel? Also, convert the voltage gains of each amplifier into units of decibels, then convert the overall voltage gain ratio into units of decibels as well. What do you notice about the overall gain of this circuit in relation to the individual amplifier gains, compared as ratios versus compared as decibel figures? Besides providing practice with ratio-to-decibel conversions, the purpose of this question is for students to realize that gains multiply as ratios but add as decibels. What do you notice about the ratio figures versus the decibel figures, regarding how the individual stage gains compare with the overall gain? Discuss with your students the nature of cascaded gain figures in both ratio and decibel formats. Which format is easier to calculate manually (without using a calculator)? Why is this? Also, convert the voltage gains of each stage into units of decibels, then convert the overall voltage gain ratio into units of decibels as well. This question is nothing more than "drill" for students to practice decibel/ratio conversions.